Project Mighty Heart's mission is to provide free, compassionate and authentic photography sessions that document very raw and very real experiences of families whose children have congenital heart diseases (CHD). one family photo session will be donated to a Heart Family. For every session booked, a Heart Family will receive a 45-60 minute photo session either in hospital or at home where they are recovering. To learn more please visit Project Mighty Hearts. Are you a Heart Family interested in investing in your own session? You can book your session here. Stella and her mom Elizabeth at Sick Kids during her 2.5 month stay. Stella and her dad Alec at home laughing and reading together. The last thing a family rushing off to The Hospital for Sick Children is thinking about is grabbing a camera to take photos. But that's exactly what I did on March 7th, 2018 when I frantically packed to get to SickKids after a cardiologist called to say I needed to get my son there within the hour. After six months of being part of the SickKids family, I created Project Mighty Hearts to document the journey of heart families at SickKids. 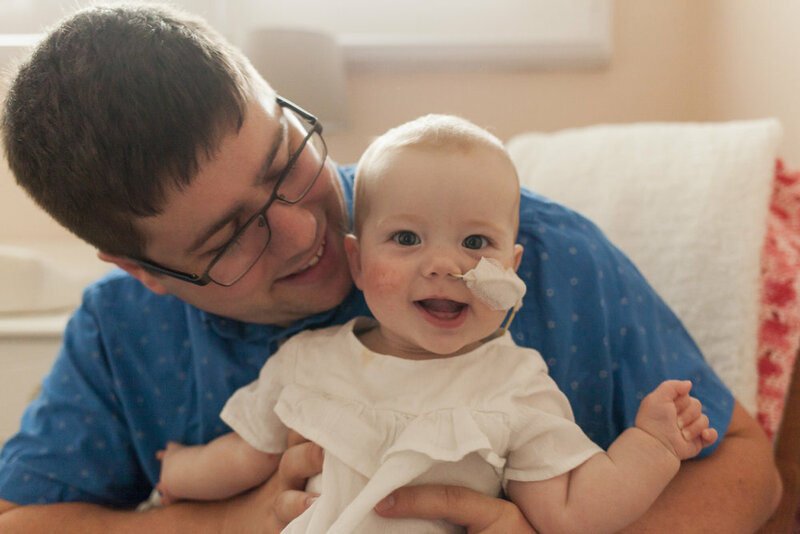 My life-changing stay at SickKids when her newborn son, Jack, was diagnosed with a congenital heart disease (CHD) was short and relatively straightforward compared to many other families on the cardiac floor. At two-and-a-half weeks old, my son was diagnosed with SVT (supra ventricular tachycardia), a heart disease that is manageable with medication. One in three babies grows out of it. If he doesn't, there is the possibility of surgery or continuing medication. My son basically has what she calls a "Mighty Heart" that is supercharged and can run into a race condition that spikes his heart rate. Our time at Sick Kids is hard to describe. I was scared but as scary of a time that is was, I wanted photos of the three of us. Not selfies, not phone photos, but photos a professional took. I needed this time in our lives captured. Because this is Jack's story as much as it is ours. He deserves to have this part of his story preserved in time for his future self. I knew I had to create something meaningful for families that were going through similar or worse experiences that I had with Dave and Jack. Which is when I decided to create Project Mighty Hearts.